THE annual Oscar Knox Cup golf challenge has raised over £20,000 for childhood cancer research. 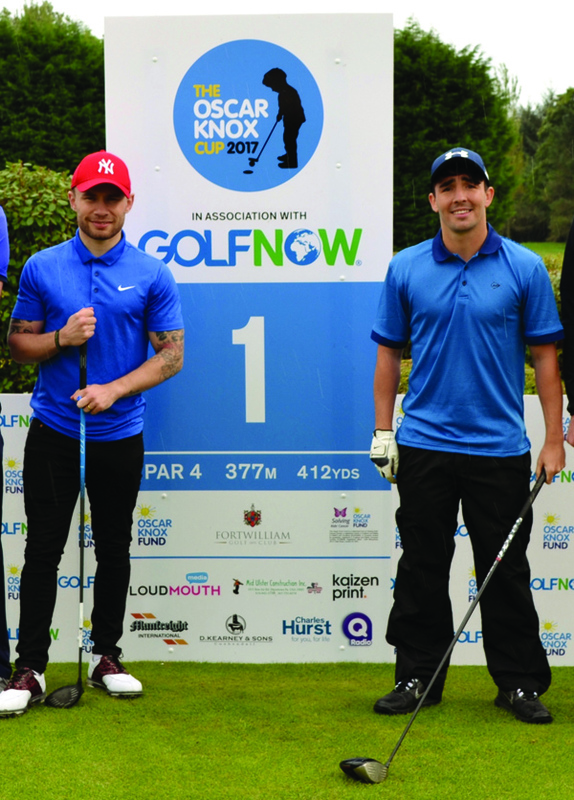 Champion boxers Carl Frampton and Jamie Conlan were among 180 golfers who took to the fairways last Friday at Fortwilliam Golf Club in aid of the cause. Local snooker professional Mark Allen lifted the trophy after a full day of competition. The Oscar Knox Cup is an annual charity golf day created by Oscar’s mum Leona and dad Stephen with the aim of raising significant funds for neuroblastoma research whilst keeping their son’s memory alive. Oscar from Mallusk died from neuroblastoma in May 2014, at just five years of age. In the first year of the golf challenge alone, more than £16,000 was raised. “Oscar was a very special little boy, and I am very proud to be involved in this wonderful event again this year,” said Mark after lifting the trophy. The event is held in September each year around the time of Oscar’s birthday, September 10. Belfast Giants Head Coach Adam Keefe, Paralympian Michael McKillop, actor Charlie Lawson, comedian Shane Todd and teenage golf prodigy Tom McKibben also took part. The golf day also marked the launch of a new charity in Oscar’s name. The Oscar Knox Fund has been set up by Oscar’s parents to raise much-needed funds for research into the childhood cancer neuroblastoma. Oscar’s dad Stephen says research into the devastating illness is crucial. “Not only is neuroblastoma a very difficult cancer to treat, but it comes with relatively few treatment options most of which are highly toxic. Neuroblastoma affects mostly babies and children under five-years-old, with the average age at diagnosis just 19 months. Despite intense and aggressive treatment, it has one of the lowest survival rates of all childhood cancers; with a child dying in the UK and Ireland from the disease every 10 days on average. “We hope that people will recognise the urgent need to address this unacceptable situation, and get behind us to help make a difference for other children and their families in Oscar’s name,” said Stephen. “The only way to improve outcomes and increase survival rates is to invest in research. Approximately 110 children are diagnosed with neuroblastoma in the UK and Ireland each year. Almost half will die, and those who do survive will suffer the horrific consequences of highly toxic treatment. You can also donate to the Oscar Knox Fund by simply texting OSCAR to 70660 to donate £3. Alternatively text OSCAR and leave a space then your preferred amount.